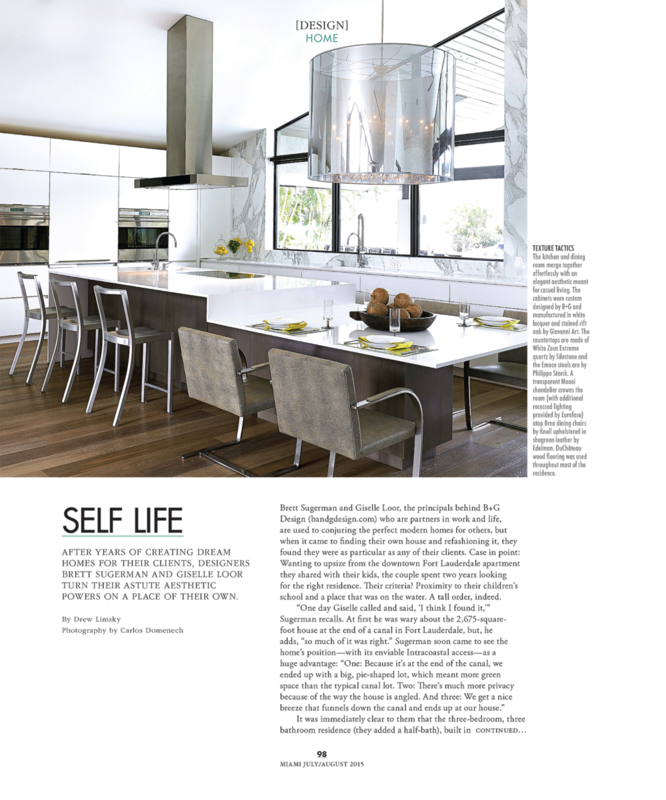 After years of creating dream homes for their clients, designers Brett Sugerman and Giselle Loor turn their astute aesthetic powers on a place of their own. Case in point: Wanting to upsize from the downtown Fort Lauderdale apartment they shared with their kids, the couple spent two years looking for the right residence. Their criteria? Proximity to their children’s school and a place that was on the water. A tall order, indeed. “One day Giselle called and said, ‘I think I found it,'”Sugerman recalls. 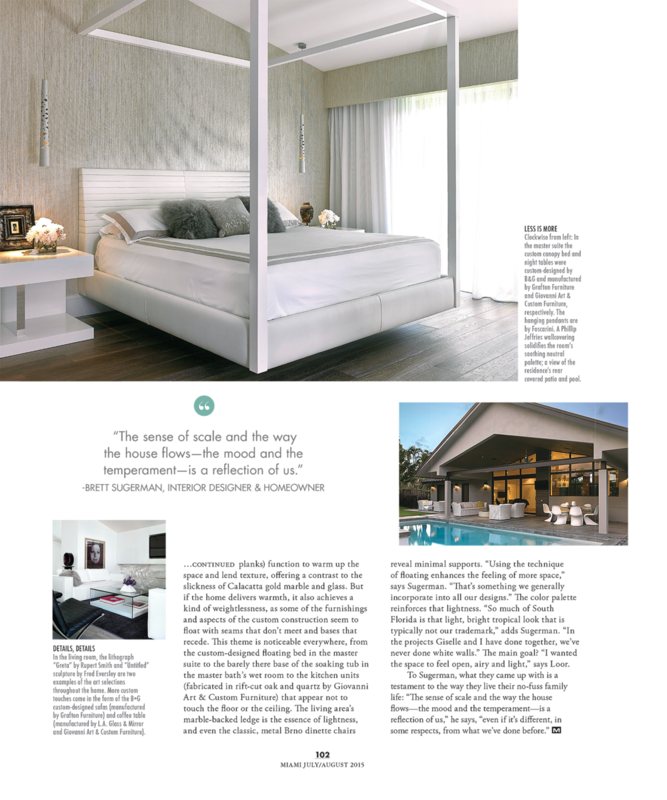 At first he was wary about the 2,675 square foot house at the end of a canal in Fort Lauderdale, but, he adds, “so much of it was right.” Sugerman soon came to see the home’s position - with its enviable Intracoastal access - as a huge advantage: “One: Because it’s at the end of the canal, we ended up with a big, pie-shaped lot, which meant more green space than the typical canal lot. Two: There’s much more privacy because of the way the house is angled. And three: We get a nice breeze that funnels down the canal and ends up at our house.” It was immediately clear to them that the three bedroom, three bathroom residence (they added a half-bath), built in the 1970s, had good bones. Unlike most buildings constructed during that era, this house boasted high cathedral ceilings. Still, a gut renovation was in order - one that became more involved than the new owners ever anticipated. Sugerman’s father was a prominent Miami architect and used to tell a joke about such undertakings. “He would talk about the ‘may-as-well’ construction company,” Sugerman remembers. “‘If you redo the walls, you may as well redo the roof.’ One thing always leads to another.” Said words of wisdom soon came true. When the duo set out to raise the roof of the master bedroom wing, they ended up changing it out completely and extending it to create a 400-square-foot outdoor patio. The use of tongue-and-groove cypress - stained in a weathered, transparent gray for more of a warm, earthy West Coast look - on the exterior walls and under the eaves softened the home’s modern lines. Inside, wood flooring and walls (using 7-inch-wide wood planks) function to warm up the space and lend texture, offering a contrast to the slickness of Calacatta gold marble and glass. But if the home delivers warmth, it also achieves a kind of weightlessness, as some of the furnishings and aspects of the custom construction seem to float with seams that don’t meet and bases that recede. This theme is noticeable everywhere, from the custom-designed floating bed in the master suite to the barely there base of the soaking tub in the master bath’s wet room to the kitchen units (fabricated in rift-cut oak and quartz by Giovanni Art & Custom Furniture) that appear not to touch the floor or the ceiling.